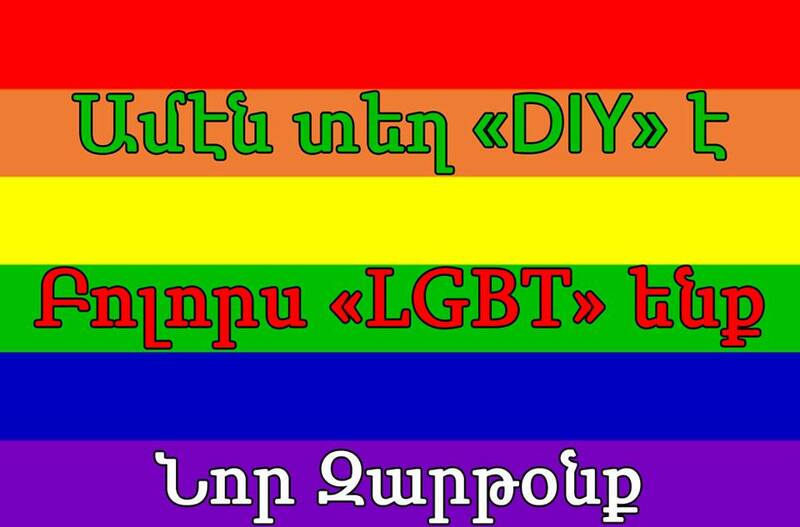 “DIY is everywhere” [“Ամեն տեղ “DIY” է”] says one poster, in reference and in solidarity with the gay friendly bar DIY in Armenia capital Yerevan that was firebombed last year in a neo-nazi style attack. 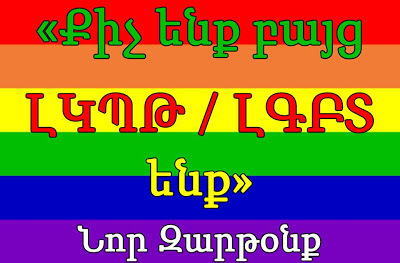 “We are all LGBT” [“Բոլորս “LGBT” ենք”], continues the same poster, echoing "We are all Hrant Dink", in reference to famous Armenian editor assassinated in Turkey. 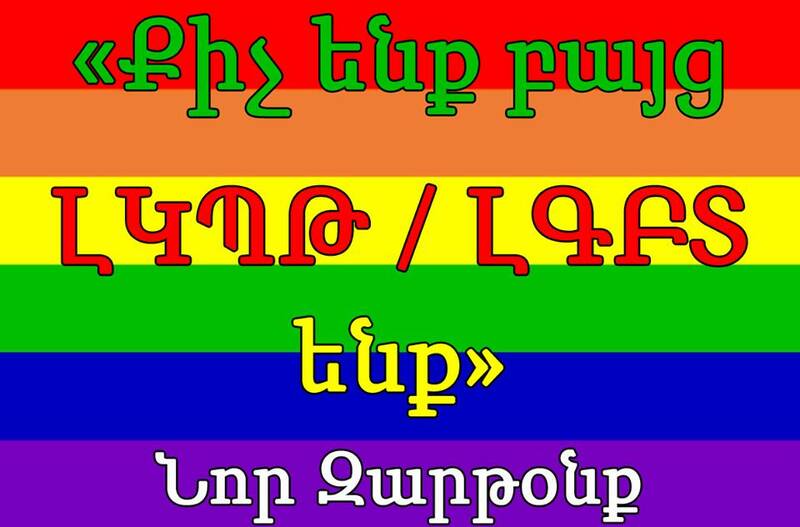 "We are few but we are LGBT" [“Քիչ ենք բայց ԼԿՊԹ/ԼԳԲՏ ենք”], says another poster, paraphrasing famous poetry by Armenian writer Paruyr Sevak ["We are few but we are called Armenians"]. There were other Armenian language posters spotted during the Pride march too. Respects and thumbs up to Nor Zartonk for these posters and for participating in the Istanbul Gay Pride. 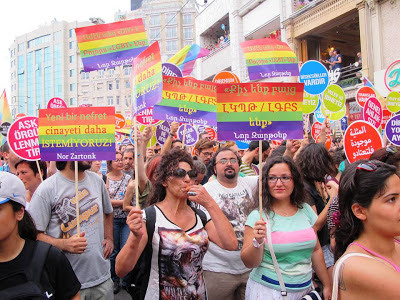 Also, great to know that some Armenians from Armenia and Diaspora participated in the Istanbul Pride events too. 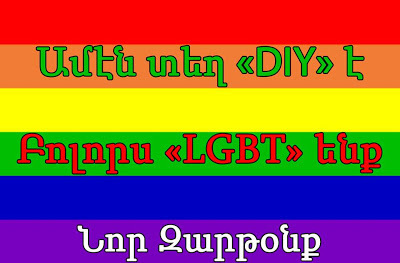 FYI: Nor Zartonk is an Armenian organisation in Istanbul (website). According to their website, Nor Zartonk “contributes to the internalization of universal and libertarian values”. “Nor Zartonk assists individuals to recognize Equality, Justice, Democracy and Peace as fundamental values and contributes the understanding of Human Rights as a whole without any kind of discrimination. 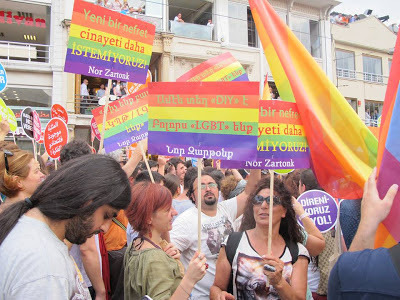 Nor Zartonk is against militarism, sexism, homophobia, racism and any kind of discrimination". They have also a Facebook group. You guys are awesome. Thank YOU!! Google at London Gay Pride 2013: "Gaygle"